Our intrepid reporter finds himself at another DrupalCon, getting to the bottom of things - with Dries Buytaert, Angie Byron, Morten DK, and Holly Ross. In software, as in life, you're either an oenophile- or a beer- maven. Not sure yet? Well, here's your guide. There are lots of new features for testing Drupal sites, making the process simpler and more efficient. Here are some examples and explanations. NYC tourist: "How do I get to Carnegie Hall?" Musician: "Practice, man, practice." The same is true for achieving expertise as a barista - or a Drupalista. With over a million chunks of content on Drupal.org - accumulated over the past ten years - the need for an overhaul is obvious. But who would benefit most from any upgrades? In Drupal, there's no single enforced path into content; there's more than one way to skin the cat. Taxonomies, vocabularies, and other options abound. Take a look. After your beloved cat dies, you'll want to preserve her in as lifelike an appearance as possible...oh wait, no, that's taxidermy. This one's about hierarchies in Drupal. Something old, something new, something borrowed, something Dru(pal). Revisioning can be straightforward, simple - and visible - with CPS. But do be careful. Why is a Data Breach Like a HAZMAT leak? Your client's e-commerce website is their precious home sweet home - and a major investment. Storing spent nuclear reactor rods in the basement is probably not a terrific idea. As the field of webside auditing expands and comes to resemble financial auditing, it's time to employ a code of standards and ethics. Here's why and how. With Drupal 8 soon out of beta, look for Debian 8 to arrive on its heels. 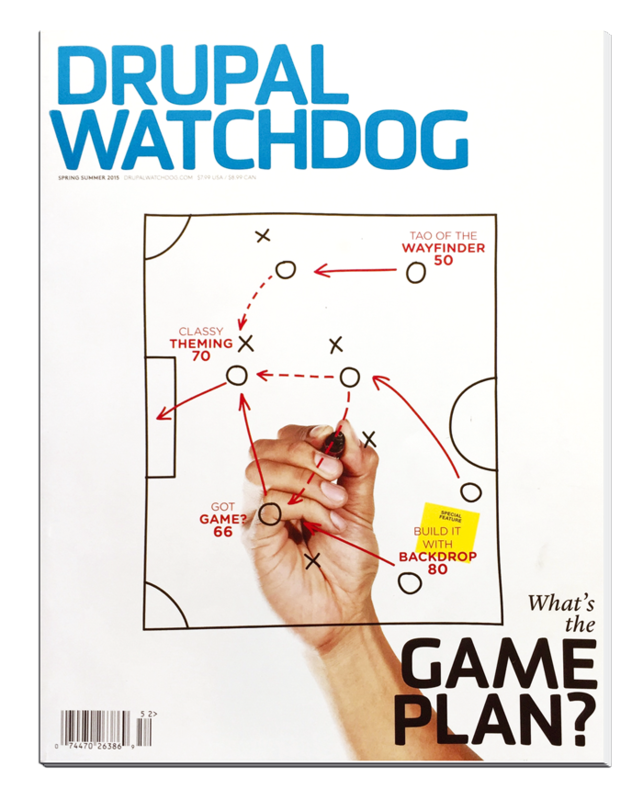 For large-scale Drupal projects, a dose of Drubian may be just what the doctor ordered. In this fifth artcle on Drush, we learn to simplify and customize many of those pesky, repetitious, cramp-inducing commands. You know the frustration - the inability of your perfectly sound mind to remember a bit of code, a file name, or a keyword you just used. Fortunately, everything you'll ever need to know is right there at the tip of a search. Here you can learn some of these skills to amp up yoru team's performance. No website remains static. In building a Drupal website for Public Radio Internation, the author's team utilized system-based thinking to create a reusable, evolving site. Get your startup in motion by creating a pretotype, which lets you toss a lot of stuff on the wall to see what sticks. What's a pretotype? Read on. Your organization needs a plan, with defined goals and an understanding of your audience; content provides the connection. Drupal 8 comes to rescue of Drupal themers. Frontenders, rejoice! Ah, dear Drupal developer, no longer need you cower under your desk and curse when you hear the words "complex multilingual site". Drupal 8 is here to make your content sparkle across multiple sites in multiple languages. Backdrop 1.0 has arrived and the co-creator is here to explain the who, why and wherefore.